Tackle your garage organization in a weekend with some of these tips. When spring cleaning comes around, one of the most dreaded tasks is cleaning out the garage. Garages have become one of the most popular storage spaces in the house. Garages are out of the way from your common living area and have ample space around the walls that isn’t taken up by your car. However, because of the convenience, garages begin to accumulate so much stuff that they become cluttered and overwhelming. By using some of these garage organization ideas, you can tackle the challenge that is your garage this spring! Before you start to organize all of the items in your garage, it’s important to know what you actually have. Many people just throw items into their storage space and forget about them. This leads to having a lot of duplicates and unwanted items in your garage taking up valuable space. To start the organization process, take an inventory of everything you have in your garage. Not only should you get rid of any duplicates, but you should also let go of any items that you don’t want or need anymore. This could be through a yard sale, giving them away to charity, or simply throwing them out. 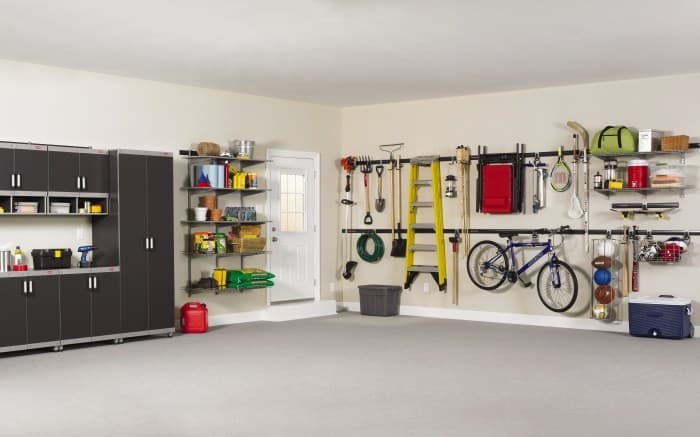 It can be difficult to let go of things that you’ve had for a while, but this can help you to streamline your space and make your garage organizing last. This can kick start any garage organization ideas that you may have. Because many garages are the size of a small apartment, you can utilize some small apartment organization ideas and apply them to your garage. Instead of zoning your space into rooms like you would in an apartment, you can zone all of your belongings by function or activity. This helps to keep the space organized after you’ve gone through all of the hard work. It also makes items much easier to find later. Start the zoning when you’re consolidating and taking your inventory by sorting your belongings and keeping like items together. This will help to maximize your space and have a flow to your garage’s organization. For instance, keep your everyday items, such as dog food and canned goods, close to the door and easily accessible. Sporting equipment can be kept together so you can easily find it all later. Storage systems come a ton of different shapes and sizes. All of them hold the same organization benefits. When you start to wade through the many different garage organization ideas, storage systems are probably one of the first things to come up. No matter what form they take, they usually line the walls leave the middle of your garage open. It may be a tight fit, but you can still keep your car’s parking spot and have your storage space. They often come in a variety of sizes to cater to the different things you may be storing in your garage. This allows you to maximize your garage’s storage space by only using spaces that fit the items you’re storing. Storage systems come in two basic designs and then different combinations of the two. The first is a standard shelving unit. You can buy these premade in a variety of materials and sizes. They range from PVC kits that lock together to welded metal shelving units. These are probably the most common form of garage storage that homeowner’s use. The second storage system that homeowners commonly use in their garages are cabinet sets. These can be found on garage walls that also house work benches. They can be used to hold tools and hardware in a somewhat organized fashion. The benefit of cabinets is that they can have opaque door that’s can hide any mess inside the unit. If you want to make the most of your garage storage system, you can use a combination of both. This gives you the flexibility of closed cabinets and open shelving. Building your own garage storage system is easy! The simple frames make it an easy weekend DIY project. The shelving unit can be constructed from lumber from any home improvement store. It’s a simple frame that can be made from 2x4”s and oriented strand board. Cabinets will be a little more complicated, as they have more hardware involved, but they’re still an easy DIY project. One of the major benefits of making your storage system a DIY project is the complete control over size and shape that you have. If you can’t find a premade unit that fits your space or you have found one but it’s out of budget, you can easily make one yourself. If you’re concerned about the stability of your shelving unit, you can always bolt it to the wall as well. This stabilizes your storage system and gives you a permanent garage organization solution. Just like the small apartment organization tips, tiny house storage ideas can give you a lot of inspiration for organizing your garage. Tiny homes have to use every part of their available space including the walls themselves. Wall storage and displaying items are common features in tiny homes that are looking to maximize their space. Wall storage uses the wall space for its storage space without taking any floor space. While it may seem like the same garage organization idea as a storage system, wall storage design have virtually no footprint in your garage. This gives your car a large parking space and frees up the walking path surrounding your car. Wall storage solutions give you the opportunity for more aesthetically pleasing storage options. You can add small baskets or metal bins to your walls for an organized storage wall in your garage. Wall storage is also a popular option for garages that hold a lot of recreational equipment, such as bikes, surfboards, and skateboards. There are two common design options for wall storage. The first is peg boards. These boards can easily be attached the wall and feature small holes that can hold hooks and pegs to hang things on. The versatility of the pegboard design option is featured in several different ways. Because it’s completely open and you choose where to insert the pegs, your peg board can hold a wide range of sizes. It accommodates larger collections, such as different tools that would normally be housed in the garage. One way to be sure that all of the items fit back onto your peg board is to draw outlines around each item. This makes sure that you know where each item goes, and if anything is missing. Slat walls are another wall storage option. They have the same basic concept of open storage on the wall by creating spaces to hang storage materials in the wall itself. It differs from the peg boards by creating tracks in the wall where you would slide the storage systems on rather than hang them on pegs in the wall. This may be a more stable option as it is held by the weight of the wall itself, rather than an individual peg. These storage solutions are often hooks or wire baskets that are made with the piece on the back to fit into the ridges of the wall. Because of the wide spaces between slats, the outline design would be very different to achieve with this garage organization idea. A peg board is one of the easiest DIY projects that you could use in your garage. In the most basic form, a pegboard is a wooden board with uniform holes drilled into it to hold pegs of a certain size and support different storage ideas. If you want the traditional tiny hole pegboard, that’s easily achievable with the right drill bit size. However, if you want a unique peg board that you can’t find in a store, you can use a larger drill bit to create a jumbo peg board. Jumbo pegboards tend to be able to support more weight as the pegs are larger. The process is the same for both designs. Mark off where you’ll drill the holes with a pencil, being sure to make all the spaces even. One way to make sure it’s even is to draw a grid and mark the meeting points. Once you’ve drilled the holes, you can leave the board in its natural state or you can paint it to give it a clean and polished finish. There are DIY versions of a slat wall for your garage, but it’s a little more complicated than the basic pegboard. The project can be completed in an afternoon if you’re an experienced DIY-er. The easiest DIY slat wall design starts with plywood boards that you cut and sand down to form T boards. Once you have your desired number of T boards, fasten them to your baseboard from the back. This will create the tracks in between the different slats. While it’s a simple DIY project and very possible, DIY slat walls should always be tested to ensure they can hold the weight that you intend to hang on it. 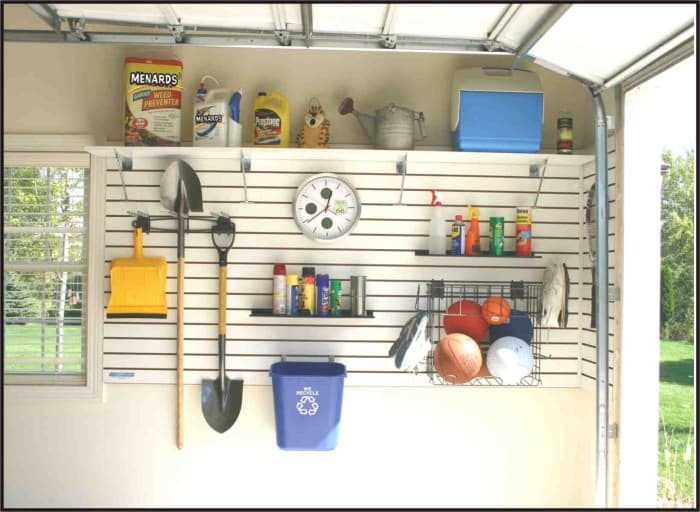 If you have a particularly small garage, you can maximize the space by using vertical storage techniques. Garage organization ideas don’t have to stay on the ground. You can use the open space in your garage’s ceiling for extra storage. This keeps the entire floor open for your car or even more storage. Attics in the main house are commonly used for storage. You can apply this idea to your garage for extra storage space. The first ceiling storage design is a sliding storage system. This storage solution is made up a series of tracks attached to the ceiling of your garage that fit around the lips of plastic tubs. This can be as simple as a singular straight track that is long enough for one or two tubs. However, you can also install tracks that run along entire ceiling. Obviously your plastic bins won’t fit around curves, but you can install several straight tracks to maximize your ceiling space. Many people fit these in the negative space between the ceiling and the garage door when it is fully open. These tubs should be limited to lighter items, such as seasonal decorations. As access to these items can be difficult, you don’t want to store plastic bins that you will need to regularly use. The second ceiling storage design is a storage loft in your garage. Garages with storage lofts are taking a hint from tiny homes and creating square footage by creating a raised platform in the garage. While this option is on a much larger scale than the sliding storage system, it is more stable and is better for items that you will want regular access to. Built like a mezzanine, your storage loft has an open face that is lined with railing for safety. 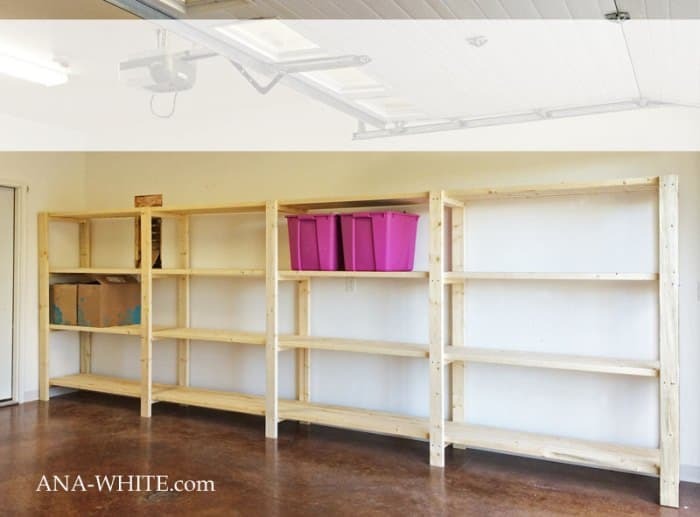 You can use other garage organization ideas in your storage loft, such as shelving systems. Garages with lofts also need a means of access to their new space. There are several loft stair options, but the two most common are ladders and spiral stairs. A ladder is a great option for small spaces because of its small footprint and mobility. It can be moved around the space as you need it. However, if you plan on accessing the space often or carrying heavy boxes up and down from your loft, a ladder won’t be the most stable option. The lack of handrails can also make it dangerous for those carrying boxes. A spiral stair has a larger footprint than a ladder, but it’s still smaller than almost any other staircase option. It’s kept to a small circle in the corner of your garage and out of the way of your parking space. It has handrails for safe use and full steps that are more stable than ladder rungs. If your garage lacks the space for a spiral stair inside, consider an outside entrance to your second floor. A spiral stair can stand up to the elements and still take up a very small space in your yard. Ceiling tracks are a simple DIY project that can be completed in a day. The frame is made from 2x4s and plywood. You want to measure the plastic bins you plan on using to make sure the tracks fit the space and the bins themselves. If you plan to install your sliding storage system between your garage door and ceiling, you want to make sure your bins will fit in this space. If you plan to install it somewhere else in the garage, measure to make sure the tracks aren’t too long. After you’ve measured and constructed the tracks, stabilize the frame and secure them to the ceiling of the garage. Building a storage loft to your garage may seem like a large project, but you can easily do it in a weekend. Garages with lofts are becoming more popular as people are looking for square footage in their homes and DIY-ers are finding easy ways to build the frames. Most garages with storage lofts feature a basic square wood frame. The project typically takes two days and requires some intermediate skill level. Your garage is the usually the place that unwanted or seasonal items are stored in. This also means that it can quickly become the most cluttered space in your house. These weekend organization tips give you easy fixes to an otherwise overwhelming room. Get a head start on your spring cleaning with these quick projects.